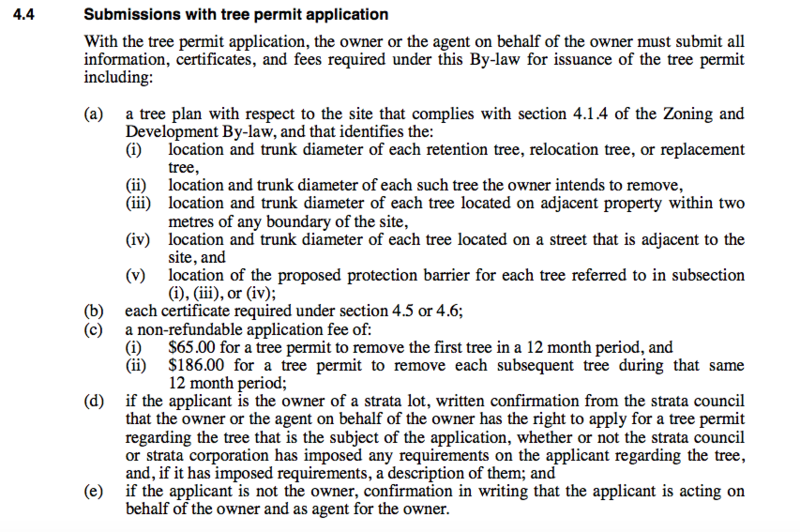 In order to remove a tree in Vancouver you must first consult the City of Vancouver By-Law No. 9958: A By-law to provide for the protection of trees. This By-Law is 11 sections, 4 amendments and an appendix totalling 46 pages! That’s right, before I remove a tree from the land I own and pay property taxes on, I have to read a 46 page by-law to make sure I am in compliance. Don’t worry, you don’t have to read the whole thing, I’ve done it for you. Despite popular belief that you can remove one tree per year, you can actually no longer remove one tree per year without a permit. That part of the by-law was amended in April 2014. All trees need a permit to be removed. A tree, for the purposes of the by-law is defined as having a diameter (width) of 20cm or greater, measured at 1.4M above ground. Here is a screen shot from www.Vancouver.ca outlining what that looks like. You’ll notice that once again, the measurements get confusing. The by-law is written in centimetres/metres and the example is provided in inches. I was talking with a friend today and he asked me to clarify the definition of a tree. Based on the fact that the stump from my backyard that you see in the picture above counts as a tree, we decided that I could tie some 2 x 4s together, dig a hole in the ground and make sure they are at least 4’5 high. The 2 x 4s have about as much life in them as the stump I am going to have to pay to remove. 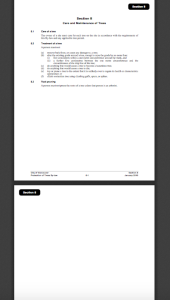 In what can only be an effort designed to kill the very trees the bylaw purports to be saving, I was surprised to find that a bunch of the pages of the by-law are actually entirely blank, save a header and footer. 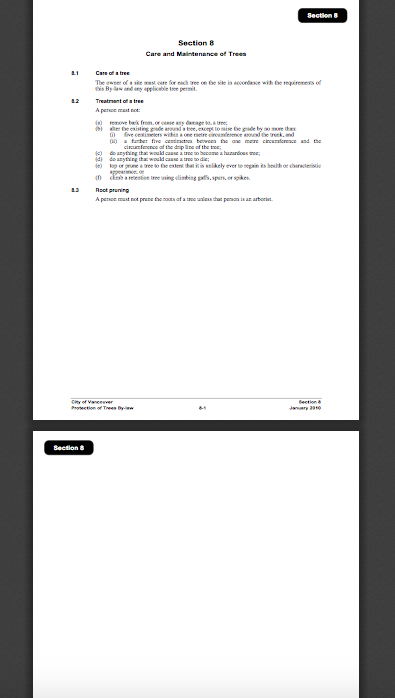 Above are are some screen shots of Schedule C2, Section 8 – Page 2 and Section 6 – Page 2. All of them, blank. There are more empty pages throughout the by-law, but you get the point. 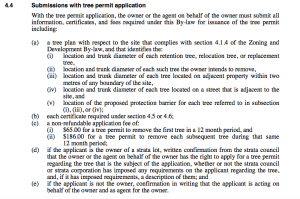 Section 4.4 says that in order to apply for a permit you need a tree plan, a permit application, an arborist report, possibly a plumbers report and a non refundable application fee of $65 for the first tree and $186 for each subsequent tree in a 12 month period. According to Section 4.5, a permit can only be issued in these circumstances. 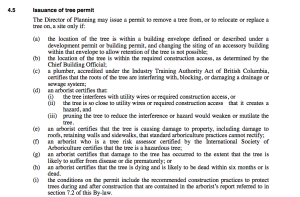 If you’d rather not read the whole thing, it basically says, you need an arborist report by someone certified with the ISA – the International Society of Arborists. The tree needs to be dead, dying or attacking some part of a building. Section 8 of the by-law speaks to the care and maintenance of trees. Basically it says you need to take better care of your trees than you do of your animals. 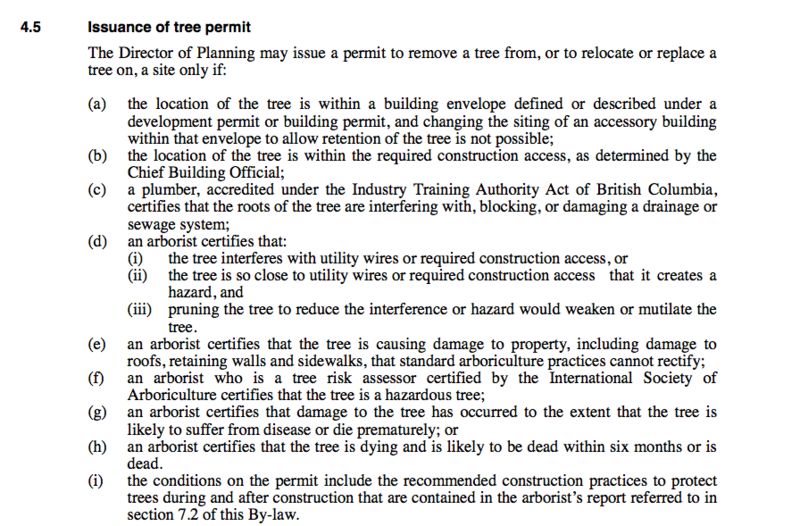 Well, not quite, but according the by-law you can’t climb a tree with gaffs, spurs or spikes. So parents, don’t let your kids climb trees after a round of golf or soccer practice. Ok, so what does this all mean for me and my new house?? It means that my stump and my almost dead pear tree deserve the same protection as the thriving fig tree in my neighbours yard AND the powerful tall maple trees that adorn lots around the city. I looked on the city of Vancouver website for a list of Arborists that would know what to do and was bounced off to the ISA website, which has a list of arborists. I made a few phone calls and some didn’t even know they were listed on this website. After talking to a few arborists, I requested two proposals. Daisy’s Landscaping sent me a quote for $380 ($399 with GST) to write the report on the 2 trees and I can submit the application and pay for the permit myself. That’s right – it is going to cost me between $561 – $650 to get permission to remove a stump and a dead pear tree from the land that I own. I want to clarify this. This is not the cost of removing the trees. That is a separate bill. This is just the permission to remove the trees. There will also be tree replacement requirements, which again will cost more money. But, that money I am happy to spend as part of my landscaping budget. Both arborists I talked to said that they would prepare the report and once the applications were submitted someone from the City would need access to the property. 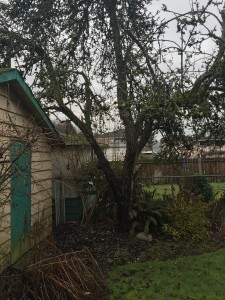 The Bartlett quote says, “A representative from the City of Vancouver will conduct a site visit to assess the tree, they will require access to the property”. WHAT?!?! ARE YOU KIDDING ME!?!?! 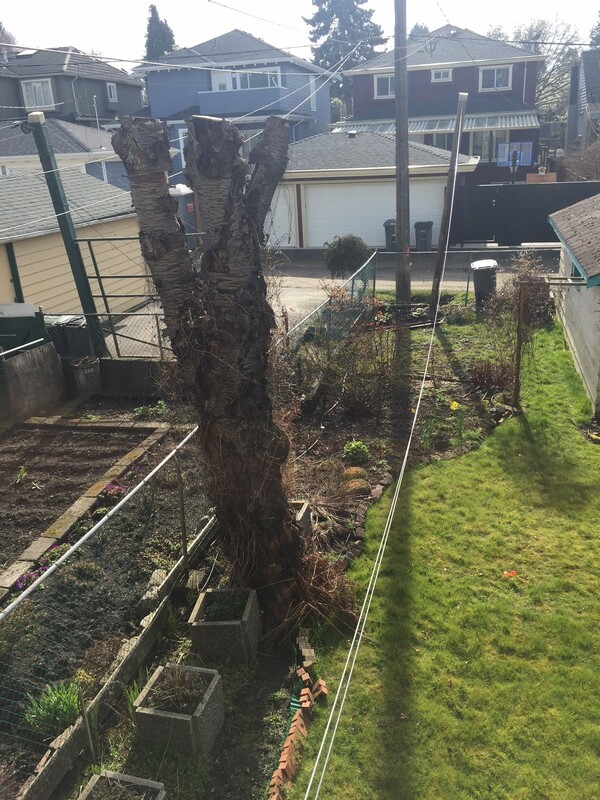 I have had to read a 46 page tree by-law, meet with 2 separate arborists to get quotes, fill out a 2 page permit application, pay $561 – $650 in non-refundable fees to arborists and the City of Vancouver and THE CITY IS STILL GOING TO SEND SOMEONE OUT TO MY PROPERTY! Why not just charge me $300 and have someone from the city come and look the first time. I’m sure the city would be better off with their own Park Board Arborists driving around looking at trees and collecting $300 instead of putting me through all these hoops, especially if they’re going to come and do a site visit anyways. I haven’t applied for my permits yet, but when I do, I’ll be sure to keep you informed. 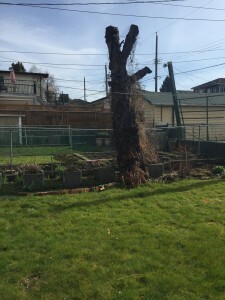 In the meantime, leave a comment below with your thoughts on, or experiences with, Vancouver’s tree protection by-law. When my neighbour and I took down a tree in my front yard. We did it at mid-day, at noon on a Friday. I stopped traffic, he took the chainsaw to it and we fell it onto our road and then quickly removed any evidence. My neighbour had the best quote that I now live by. He stated “Sometimes, It’s easier to beg for forgiveness than it is to ask for permission”… What are the fines for just seeing them fall in a wind storm? Could you put some cuts in the bottom but not fall them? If mother nature takes them down, then what? Does she get fined? Despite anything they say in public, the city of Vancouver is clearly not interested in affordability in this city. The recent building code changes, while mostly good, are also mostly not ‘necessary’ for 90% of homes. Don’t even bother with the carrying costs for the 4-12 months that you can do nothing but go through the permit process. Sprinklers, while a great idea, are not just about sprinklers. The upgrade to your water supply is probably just as expensive as the sprinkler system…..a city make work project. blah, blah, blah! A joke indeed. 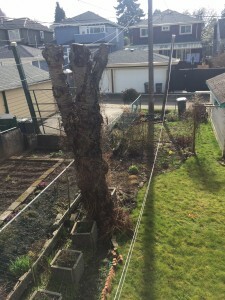 I am a professional forester and had a tree in my front yard with significant trunk rot. It was 70 feet tall and only a few feet from my neighbours house. I spent over an hour arguing with the City that my professional credentials, photographic evidence, common sense and the obligatory visit from a City arborist should negate any need for a $250 arborist inspection. I lost. If you want evidence of the utter hypocrisy of Vision’s “green” agenda, including their attitude towards cutting down trees, take a look at the East Fraserlands development near Marine Way and Boundary Road, currently in progress. As part of this development, hundreds, if not thousands, of trees have been cut down, with more to come. I’m sure if anyone brought this up with Vision now, they would weasel out of any responsibility by pointing out that the ball started rolling for this project in 2004, long before they came to power. I went through the house building process in Vancouver in 2013. For the most part, it went through smoothly, so I was very lucky and I am thankful for that. Given the new changes in 2015, I do not think I would be able to afford it if I were to build now (nor would my sanity hold). 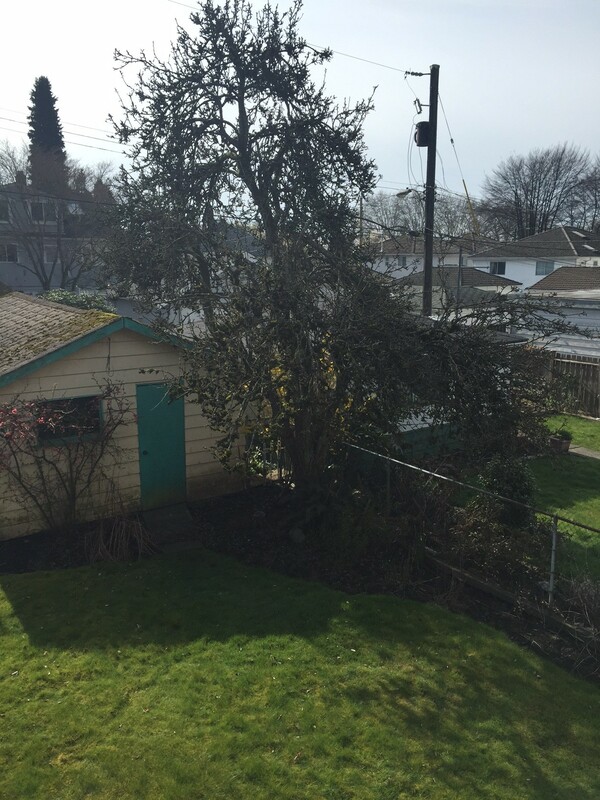 On the topic of trees, there were 2 on my neighbours property that affected the potential layout of my house. One was healthy but unsightly (even my neighbour agreed), and the other was dead. Unfortunately they only agreed to remove the dead one. After going through the tree removal process with the City, they allowed the removal of the dead tree, but required the other tree to be protected/inspected during construction of my house. The City also limited the size of my rear patio because of that tree. I hope my neighbours do not sell anytime soon because I do not want that tree coming down now that my house is finished. The morale of this story is – when buying a lot to build on, be wary of neighbouring trees that may affect your plans. We believe ideas come from everyone, everywhere. At Building In Vancouver, everyone within our agency walls is a designer in their own right. And there are a few principles we believe about our design craft. These truths drive us, motivate us, and ultimately help us redefine the power of design. This is just a sample text widget, add your own in Admin -> Widgets. © 2019 Building In Vancouver. Theme by XtremelySocial and Blacktie.